Before President Donald Trump even arrived in Salt Lake City, he had a crowd waiting to tell him he’d be wrong to revise the boundaries of two national monuments in southern Utah. Hundreds of people soon became thousands at the footsteps of the Capitol, most decrying the anticipated announcement that Grand Staircase-Escalante and Bears Ears national monuments would be drastically shrunken and broken into parts. Other protesters gathered at The Church of Jesus Christ of Latter-day Saints’ Welfare Square, where Trump met with Mormon church leaders and toured the facility, which provides food and materials for the poor. 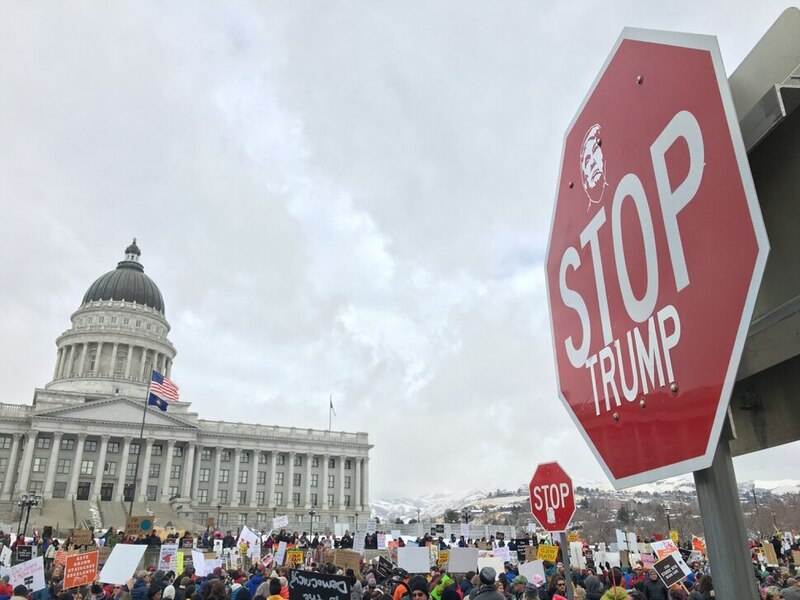 And as Trump came and went, taking monument status on more than 2 million acres with him, hundreds walked the snow-laden streets to kneel on State Street and shut down traffic on one of Salt Lake City’s main downtown arteries. A standoff ensued with a few dozen Salt Lake City police officers equipped with shields, helmets and body armor. Monday was the second protest in three days for some who gathered in the fresh snow at the Capitol on Monday morning, singing, chanting and holding signs in support of monuments or against Trump. “My granddaughter wanted to be here to throw a rotten tomato” at Trump, said Gina Zhdilkov, 56, of Bountiful. Trump, she said, was reversing any achievement from President Barack Obama, who designated the formerly 1.35-million-acre Bears Ears National Monument in late December 2016. (Trent Nelson | The Salt Lake Tribune) Protesters try to drown out a man trolling them with a megaphone at a rally against a visit by President Donald Trump, Monday December 4, 2017. (Trent Nelson | The Salt Lake Tribune) A man is hit in the head by a protester during an altercation at a rally protesting a visit by President Donald Trump, Monday December 4, 2017. (Rich Kane | The Salt Lake Tribune) Protesters rally against a visit by President Donald Trump, Monday December 4, 2017. (Rick Egan | The Salt Lake Tribune) Perry Dixon, stands with his kids Miles, 6, and Parker 9, as they protest President Trump's visit to Utah to shrink the Bears Ears monument in front of the Utah State Capitol Building, Monday, December 4, 2017. (Trent Nelson | The Salt Lake Tribune) Kris Moore holds up a sign as protesters gather before a visit by President Donald Trump, Monday December 4, 2017. (Rachel Molenda | The Salt Lake Tribune) Protesters start to gather outside the Utah State Capitol ahead of President Donald Trump's speech where he is expected to sign an executive order reducing the size of Bears Ears and Grand Staircase - Escalante National Monuments. (Trent Nelson | The Salt Lake Tribune) Protesters gather before a visit by President Donald Trump, Monday December 4, 2017. (Rick Egan | The Salt Lake Tribune) Kourtney Moore, of Salt Lake City protests President Trump's visit to Utah to shrink the Bears Ears monument in front of the Utah State Capitol Building, Monday, December 4, 2017. (Trent Nelson | The Salt Lake Tribune) Protesters gather before a visit by President Donald Trump, Monday December 4, 2017. (Rick Egan | The Salt Lake Tribune) Dan Ransom, of Salt Lake City, protests President Trump's visit to Utah to shrink the Bears Ears monument in front of the Utah State Capitol Building, Monday, December 4, 2017. (Trent Nelson | The Salt Lake Tribune) Protesters gather before a visit by President Donald Trump, Monday December 4, 2017. (Trent Nelson | The Salt Lake Tribune) Protesters gather before a visit by President Donald Trump, Monday December 4, 2017. (Trent Nelson | The Salt Lake Tribune) Tami Sablan and other protesters chant before a visit by President Donald Trump, Monday December 4, 2017. (Trent Nelson | The Salt Lake Tribune) Protesters gather before a visit by President Donald Trump, Monday December 4, 2017. (Trent Nelson | The Salt Lake Tribune) A man holds a sign supporting Trump as protesters gather before a visit by President Donald Trump, Monday December 4, 2017. (Trent Nelson | The Salt Lake Tribune) Protesters gather before a visit by President Donald Trump, Monday December 4, 2017. (Trent Nelson | The Salt Lake Tribune) Don Thorpe holds a sign as protesters gather before a visit by President Donald Trump, Monday December 4, 2017. (Trent Nelson | The Salt Lake Tribune) Protesters gather before a visit by President Donald Trump, Monday December 4, 2017. (Trent Nelson | The Salt Lake Tribune) Protesters gather before a visit by President Donald Trump, Monday December 4, 2017. (Trent Nelson | The Salt Lake Tribune) Protesters gather before a visit by President Donald Trump, Monday December 4, 2017. (Rick Egan | The Salt Lake Tribune) Protesters gather for President Trump's visit to Utah, in front of the Utah State Capitol Building, as he is expected to shrink the Bears Ears and Grand Staircase monuments, iMonday, December 4, 2017. (Rick Egan | The Salt Lake Tribune) Laura Becker of North Salt Lake protests President Trump's visit to Utah to shrink the Bears Ears monument in front of the Utah State Capitol Building, Monday, December 4, 2017. (Rick Egan | The Salt Lake Tribune) Dave Jones protests President Trump's visit to Utah to shrink the Bears Ears monument in front of the Utah State Capitol Building, Monday, December 4, 2017. (Rick Egan | The Salt Lake Tribune) Shirley Arnott of North Salt Lake protests President Trump's visit to Utah to shrink the Bears Ears monument in front of the Utah State Capitol Building, Monday, December 4, 2017. (Rachel Molenda | The Salt Lake Tribune) Protesters try to down out a supporter of President Donald Trump with a bullhorn outside the Utah State Capitol on Monday, Nov. 4, 2017. Trump is in Salt Lake City to sign an executive order to shrink Bears Ears and Grand Staircase-Escalante national monuments. (Rick Egan | The Salt Lake Tribune) Glenn Hayes, Grand Junction, Colorado, holds a sign as protesters gather for President Trump's visit to Utah, in front of the Utah State Capitol Building, as he is expected to shrink the Bears Ears and Grand Staircase monuments, iMonday, December 4, 2017. (Rick Egan | The Salt Lake Tribune) Ann Burbidge holds a sign as protesters gather for President Trump's visit to Utah, in front of the Utah State Capitol Building, as he is expected to shrink the Bears Ears and Grand Staircase monuments, iMonday, December 4, 2017. (Rachel Molenda | The Salt Lake Tribune) Police in riot gear ask protesters to move to the south side of the street near the Utah Capitol after President Donald Trump's speech inside. (Trent Nelson | The Salt Lake Tribune) Protesters from opposite sides yell at each other during a rally against a visit by President Donald Trump, Monday December 4, 2017. (Trent Nelson | The Salt Lake Tribune) A man yells at the crowd after an altercation during a rally protesting a visit by President Donald Trump, Monday December 4, 2017. (Trent Nelson | The Salt Lake Tribune) Protesters rally against a visit by President Donald Trump, Monday December 4, 2017. (Trent Nelson | The Salt Lake Tribune) Protesters rally against a visit by President Donald Trump, Monday December 4, 2017. 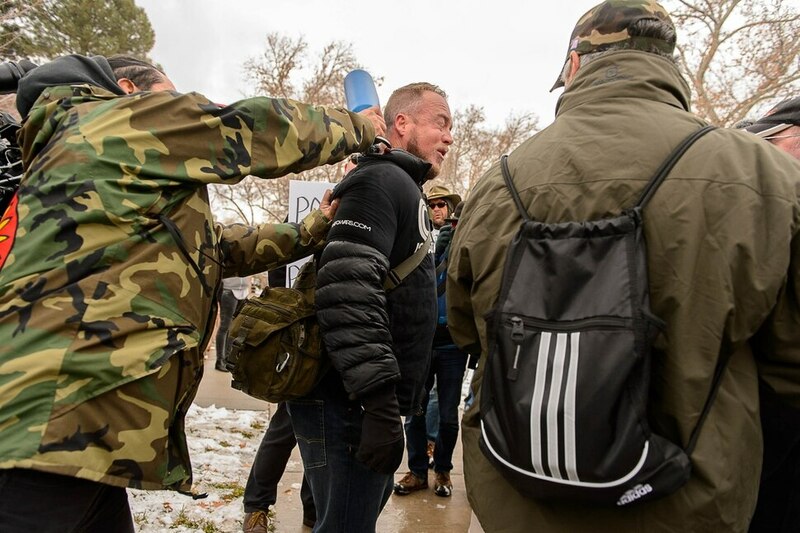 (Trent Nelson | The Salt Lake Tribune) A protester is pushed back after assaulting a counter-protester during a rally against a visit by President Donald Trump, Monday December 4, 2017. (Trent Nelson | The Salt Lake Tribune) Protesters rally against a visit by President Donald Trump, Monday December 4, 2017. (Trent Nelson | The Salt Lake Tribune) Protesters rally against a visit by President Donald Trump, Monday December 4, 2017. (Trent Nelson | The Salt Lake Tribune) Protesters rally against a visit by President Donald Trump, Monday December 4, 2017. (Trent Nelson | The Salt Lake Tribune) A dance group performs as protesters rally against a visit by President Donald Trump, Monday December 4, 2017. (Rick Egan | The Salt Lake Tribune) Stop sign near the Utah State Capitol, during President Trump's visit to Salt Lake CIty, Monday, December 4, 2017. (Rick Egan | The Salt Lake Tribune) Ann Burbidge holds a sign as protesters gather for President Trump's visit to Utah in front of the Utah State Capitol Building, as he is expected to shrink the Bears Ears and Grand Staircase monuments, Monday, December 4, 2017. (Rachel Molenda | The Salt Lake Tribune) Police ask protesters to move to a free speech zone one block away at the capitol building in Salt Lake City, Utah, on Monday, December 4, 2017. (Rachel Molenda | The Salt Lake Tribune) A Trump supporter turns away from protesters at the capitol building in Salt Lake City, Utah, on Monday, December 4, 2017. (Rachel Molenda | The Salt Lake Tribune) Protesters and a Trump supporter scream at one another outside the capitol building in Salt Lake City, Utah, on Monday, December 4, 2017. (Rachel Molenda | The Salt Lake Tribune) A police officer separates protesters and a Trump supporter outside the capitol building in Salt Lake City, Utah, on Monday, December 4, 2017. (Rachel Molenda | The Salt Lake Tribune) A police officer separates protesters and a Trump supporter outside the capitol building in Salt Lake City, Utah, on Monday, December 4, 2017. (Rachel Molenda | The Salt Lake Tribune) Police retrieve their fellow officers on State Street and 100 S in Salt Lake City, Utah, on Monday, December 4, 2017. (Rachel Molenda | The Salt Lake Tribune) President Donald Trump leaves the capitol building in Salt Lake City, Utah, after announcing his plan to shrink Bears Ears and Grand Staircase Escalante national monuments on Monday, December 4, 2017. (Rachel Molenda | The Salt Lake Tribune) President Donald Trump leaves the capitol building in Salt Lake City, Utah, after announcing his plan to shrink Bears Ears and Grand Staircase Escalante national monuments on Monday, December 4, 2017. Among the group were members of the Native American tribes that pushed for the added protection from development that comes with national monument designation. “We are here supporting that the national monuments not be reduced or rescinded,” said Kenneth Maryboy, a Navajo tribal member and board member of Utah Dine Bikeyah, the group that fought for the Bears Ears designation. Many echoed the fear that the land that’s no longer part of a monument will be subject to mining and development. Inside, the Capitol was packed with Trump supporters who celebrated Trump’s declaration as an economic victory for rural Utahns who depend on mineral development and ranching, activities they say were stifled by the sprawling monuments. Outside, the the antagonistic crowd was peppered with only a few people celebrating the announcement, many wearing red “Make America Great Again” hats and holding signs calling for smaller monuments. One among them, who declined to give his name, said any reduction of Grand Staircase-Escalante National Monument, which President Bill Clinton created in 1996, “would be an improvement.” Those in the massive crowd across the street were paid to be there, he said, and said others had been paid to travel south to Escalante in the past. Wade Frischknecht, of Salt Lake, also wore a red hat. He stood first among protesters and later crossed the street, where Trump supporters gathered. “I came to see my president,” he said. Before Trump’s move to revise the boundaries, the two monuments had a combined footprint of more than 3 million acres in southern Utah. That was the right amount for Rupert Steele, a member of the Goshute tribe. Today’s action is “a bad precedent,” he said. Some waiting for Trump were protesting the man in general more than today’s actions in particular. Hopkins was demonstrating near Welfare Square. Around 12:30 p.m., Trump’s motorcade took him from Welfare Squares to supporters waiting inside the Capitol where he would announce the monuments’ new, smaller boundaries. At the same time, a large group left the Capitol protest area and marched south down State Street. The crowd of about 500 walked through traffic downtown and stopped in the street in front of the Wallace F. Bennett federal building at 100 South, blocking traffic from all directions. They were chanting against Trump, Hatch and the smaller monuments. (Trent Nelson | The Salt Lake Tribune) A protester shakes hands with a police officer after a rally against a visit by President Donald Trump, Monday December 4, 2017. (Trent Nelson | The Salt Lake Tribune) Protesters clash with motorists after blocking off an intersection after a rally against a visit by President Donald Trump, Monday December 4, 2017. (Trent Nelson | The Salt Lake Tribune) Police back up as protesters approach downtown after a rally against a visit by President Donald Trump, Monday December 4, 2017. (Trent Nelson | The Salt Lake Tribune) Protesters rally against a visit by President Donald Trump, Monday December 4, 2017. (Trent Nelson | The Salt Lake Tribune) Protesters block off an intersection downtown after a rally against a visit by President Donald Trump, Monday December 4, 2017. (Trent Nelson | The Salt Lake Tribune) Protesters let a bus through an intersection they had blocked off downtown after a rally against a visit by President Donald Trump, Monday December 4, 2017. (Trent Nelson | The Salt Lake Tribune) Protesters march down State Street during rally against a visit by President Donald Trump, Monday December 4, 2017. (Trent Nelson | The Salt Lake Tribune) Protesters march down State Street during rally against a visit by President Donald Trump, Monday December 4, 2017. (Trent Nelson | The Salt Lake Tribune) A woman looks on as police and protesters downtown after a rally against a visit by President Donald Trump, Monday December 4, 2017. (Rachel Molenda | The Salt Lake Tribune) Jason Lutu, left, of Lehi, and Donald Tarter, right, of Salt Lake City, gatherd in front of the capitol building in Salt Lake City, Utah, on Monday, December 4, 2017. Lutu said he was there supporting President Donald Trump's plan to shrink Bears Ears and Grand Staircase Escalante, while Tarter said he is against the plan. (Rachel Molenda | The Salt Lake Tribune) Daniel Tucson, of Salt Lake City, burns sage and prays at a protest against shrinking Bears Ears and Grand Staircase Escalante national monuments on Monday, December 4, 2017. (Rachel Molenda | The Salt Lake Tribune) Protesters gathered on Monday, December 4, 2017. to protest President Donald Trump's plan to shrink Bears Ears and Grand Staircase-Escalante national monuments. (Rachel Molenda | The Salt Lake Tribune) Protesters attempt to shout down a counter protester during President Donald Trump's announcment to shrink Bears Ears and Grand Staircase Escalante national monuments at the capitol building in Salt Lake City, Utah, on Monday, December 4, 2017. (Rachel Molenda | The Salt Lake Tribune) Protesters gathered at the capitol building in Salt Lake City, Utah, on Monday, December 4, 2017, to protest President Donald Trump's plan to shrink Bears Ears and Grand Staircase-Escalante national monuments. (Rachel Molenda | The Salt Lake Tribune) Protesters gathered at the capitol building in Salt Lake City, Utah, on Monday, December 4, 2017, as President Donald Trump arrived to announce his plan to shrink Bears Ears and Grand Staircase-Escalante national monuments. (Rachel Molenda | The Salt Lake Tribune) Protesters gathered on Monday, December 4, 2017. to protest President Donald Trump's plan to shrink Bears Ears and Grand Staircase-Escalante national monuments. (Rachel Molenda | The Salt Lake Tribune) Protesters gathered at the capitol building in Salt Lake City, Utah, on Monday, December 4, 2017, to protest President Donald Trump's plan to shrink Bears Ears and Grand Staircase-Escalante national monuments. 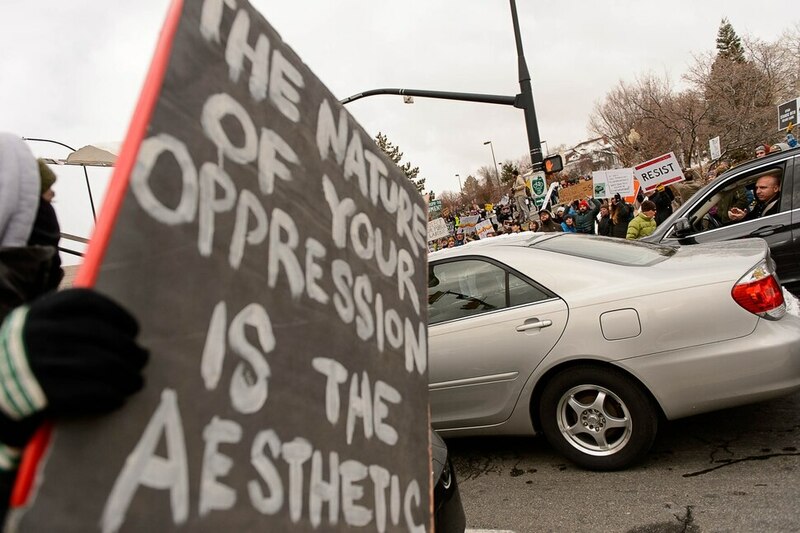 (Scott Sommerdorf | The Salt Lake Tribune) Protestors shout This is what democracy looks like! as they confront SLCPD as they blocked State Street near 100 South after President Trump's visit to Salt Lake City, Monday, December 4, 2017. (Rachel Molenda | The Salt Lake Tribune) Protesters gathered on Monday, December 4, 2017. to protest President Donald Trump's plan to shrink Bears Ears and Grand Staircase-Escalante national monuments. (Scott Sommerdorf | The Salt Lake Tribune) Workers inside the Federal Building watched as protestors blocked State Street near 100 South after President Trump's visit to Salt Lake City, Monday, December 4, 2017. (Rachel Molenda | The Salt Lake Tribune) Protesters at the Utah state capitol do a dance to Toxic by Britney Spears on Monday, December 4, 2017, to illustrate their feelings about President Donald Trump's plan to shrink Bears Ears and Grand Staircase national monuments. (Rachel Molenda | The Salt Lake Tribune) Protesters gathered at the capitol building in Salt Lake City, Utah, on Monday, December 4, 2017, as President Donald Trump arrived to announce his plan to shrink Bears Ears and Grand Staircase-Escalante national monuments. (Rachel Molenda | The Salt Lake Tribune) Sam Feuerborn, left, and Lindsay Gurley, of Carbondale, Colorado, protest President Donald Trump's plan to shrink Bears Ears and Grand Staircase-Escalante national monuments in southern Utah. Monday, December 4, 2017. 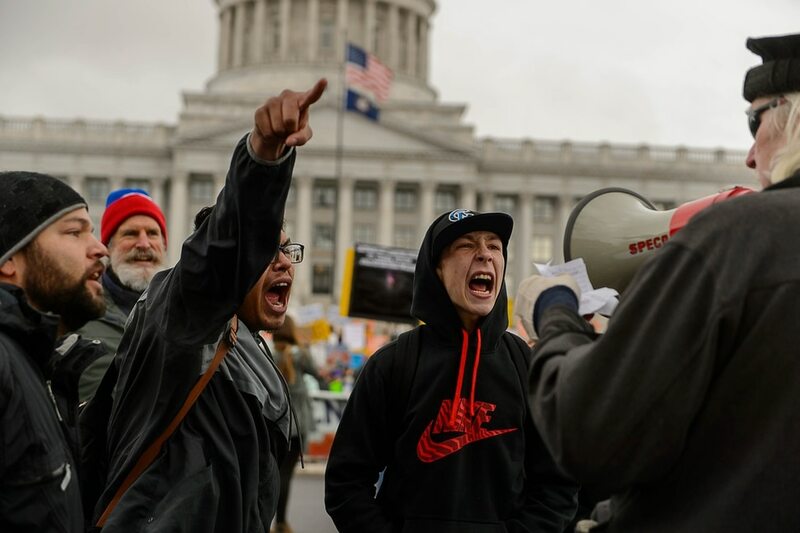 (Scott Sommerdorf | The Salt Lake Tribune) Protestors shout This is what democracy looks like! as they confront SLCPD as they blocked State Street near 100 South after President Trump's visit to Salt Lake City, Monday, December 4, 2017. (Rachel Molenda | The Salt Lake Tribune) Protesters gathered on Monday, December 4, 2017. to protest President Donald Trump's plan to shrink Bears Ears and Grand Staircase-Escalante national monuments. (Rachel Molenda | The Salt Lake Tribune) Protesters gathered at the capitol building in Salt Lake City, Utah, on Monday, December 4, 2017, to protest President Donald Trump's plan to shrink Bears Ears and Grand Staircase-Escalante national monuments. (Rachel Molenda | The Salt Lake Tribune) Protesters gathered on Monday, December 4, 2017. to protest President Donald Trump's plan to shrink Bears Ears and Grand Staircase-Escalante national monuments. (Scott Sommerdorf | The Salt Lake Tribune) Reminiscent of a 1960's protest image, a woman offers flowers to SLCPD who had deployed on State Street after the protestors blocked the street near 100 South after President Trump's visit to Salt Lake City, Monday, December 4, 2017. (Scott Sommerdorf | The Salt Lake Tribune) SLCPD confronted protestors as they blocked State Street near 100 South after President Trump's visit to Salt Lake City, Monday, December 4, 2017. 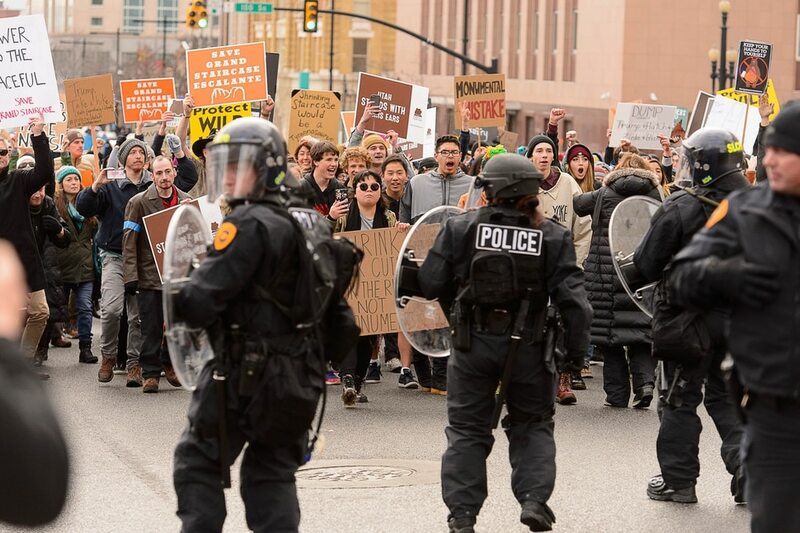 (Scott Sommerdorf | The Salt Lake Tribune) Police retreat away from protestors who had blocked State Street near 100 South after President Trump's visit to Salt Lake City, Monday, December 4, 2017. (Scott Sommerdorf | The Salt Lake Tribune) Protestors marched away from the capitol building after President Trump's visit to Salt Lake City, Monday, December 4, 2017. (Rick Egan | The Salt Lake Tribune) Police attempt to disperse protesters as they block traffic on State Street, during President Trump's visit to Salt Lake City, Monday, December 4, 2017. (Trent Nelson | The Salt Lake Tribune) Protesters block off an intersection downtown after a rally against a visit by President Donald Trump, Monday December 4, 2017. (Trent Nelson | The Salt Lake Tribune) A man tries to shout down a counter-protester at a rally against a visit by President Donald Trump, Monday December 4, 2017. (Trent Nelson | The Salt Lake Tribune) Protesters block off an intersection downtown after a rally against a visit by President Donald Trump, Monday December 4, 2017. (Trent Nelson | The Salt Lake Tribune) People inside the Federal Building look down as protesters block off an intersection downtown after a rally against a visit by President Donald Trump, Monday December 4, 2017. (Trent Nelson | The Salt Lake Tribune) Protesters march down State Street after a rally against a visit by President Donald Trump, Monday December 4, 2017. (Trent Nelson | The Salt Lake Tribune) Protesters block off an intersection downtown after a rally against a visit by President Donald Trump, Monday December 4, 2017. (Trent Nelson | The Salt Lake Tribune) Protesters block off an intersection downtown after a rally against a visit by President Donald Trump, Monday December 4, 2017. (Trent Nelson | The Salt Lake Tribune) A motorist argues with protesters after they blocked off an intersection after a rally against a visit by President Donald Trump, Monday December 4, 2017. (Trent Nelson | The Salt Lake Tribune) Protesters block off an intersection downtown after a rally against a visit by President Donald Trump, Monday December 4, 2017. (Trent Nelson | The Salt Lake Tribune) Protesters let a bus through an intersection they had blocked off downtown after a rally against a visit by President Donald Trump, Monday December 4, 2017. (Trent Nelson | The Salt Lake Tribune) Protesters march down State Street through traffic after a rally against a visit by President Donald Trump, Monday December 4, 2017. (Trent Nelson | The Salt Lake Tribune) Police and protesters downtown after a rally against a visit by President Donald Trump, Monday December 4, 2017. (Trent Nelson | The Salt Lake Tribune) Protesters march down State Street after a rally against a visit by President Donald Trump, Monday December 4, 2017. (Trent Nelson | The Salt Lake Tribune) Police and protesters downtown after a rally against a visit by President Donald Trump, Monday December 4, 2017. (Trent Nelson | The Salt Lake Tribune) Protesters and police meet downtown after a rally against a visit by President Donald Trump, Monday December 4, 2017. (Trent Nelson | The Salt Lake Tribune) Police and protesters downtown after a rally against a visit by President Donald Trump, Monday December 4, 2017. (Trent Nelson | The Salt Lake Tribune) A crowd looks on as police and protesters face off downtown after a rally against a visit by President Donald Trump, Monday December 4, 2017. (Trent Nelson | The Salt Lake Tribune) Protesters clash with motorists after blocking off an intersection after a rally against a visit by President Donald Trump, Monday December 4, 2017. (Trent Nelson | The Salt Lake Tribune) Protesters block off an intersection downtown after a rally against a visit by President Donald Trump, Monday December 4, 2017. (Trent Nelson | The Salt Lake Tribune) Protesters square off with a line of police after a rally against a visit by President Donald Trump, Monday December 4, 2017. (Trent Nelson | The Salt Lake Tribune) Protesters block off an intersection downtown after a rally against a visit by President Donald Trump, Monday December 4, 2017. (Trent Nelson | The Salt Lake Tribune) Protesters block off an intersection downtown after a rally against a visit by President Donald Trump, Monday December 4, 2017. (Trent Nelson | The Salt Lake Tribune) A man pulls out a self defense baton as another man prepares to throw a drink at him. Protesters rally against a visit by President Donald Trump, Monday December 4, 2017. (Trent Nelson | The Salt Lake Tribune) Protesters block off an intersection downtown after a rally against a visit by President Donald Trump, Monday December 4, 2017. (Trent Nelson | The Salt Lake Tribune) Protesters block off an intersection downtown after a rally against a visit by President Donald Trump, Monday December 4, 2017. (Trent Nelson | The Salt Lake Tribune) Protesters block an intersection downtown after a rally against a visit by President Donald Trump, Monday December 4, 2017. (Trent Nelson | The Salt Lake Tribune) Protesters rally against a visit by President Donald Trump, Monday December 4, 2017. (Trent Nelson | The Salt Lake Tribune) Protesters march down State Street during rally against a visit by President Donald Trump, Monday December 4, 2017. (Trent Nelson | The Salt Lake Tribune) Protesters march down State Street during rally against a visit by President Donald Trump, Monday December 4, 2017. (Rachel Molenda | The Salt Lake Tribune) Protesters gathered on Monday, December 4, 2017. to protest President Donald Trump's plan to shrink Bears Ears and Grand Staircase-Escalante national monuments. (Rachel Molenda | The Salt Lake Tribune) Protesters attempt to shout down a counter protester during President Donald Trump's announcment to shrink Bears Ears and Grand Staircase Escalante national monuments at the capitol building in Salt Lake City, Utah, on Monday, December 4, 2017. (Rachel Molenda | The Salt Lake Tribune) Protesters gathered at the capitol building in Salt Lake City, Utah, on Monday, December 4, 2017, to protest President Donald Trump's plan to shrink Bears Ears and Grand Staircase-Escalante national monuments. (Rachel Molenda | The Salt Lake Tribune) Protesters gathered at the capitol building in Salt Lake City, Utah, on Monday, December 4, 2017, as President Donald Trump arrived to announce his plan to shrink Bears Ears and Grand Staircase-Escalante national monuments. (Rachel Molenda | The Salt Lake Tribune) Protesters gathered at the capitol building in Salt Lake City, Utah, on Monday, December 4, 2017, to protest President Donald Trump's plan to shrink Bears Ears and Grand Staircase-Escalante national monuments. (Rachel Molenda | The Salt Lake Tribune) Protesters at the Utah state capitol do a dance to Toxic by Britney Spears on Monday, December 4, 2017, to illustrate their feelings about President Donald Trump's plan to shrink Bears Ears and Grand Staircase national monuments. (Rick Egan | The Salt Lake Tribune) Protesters chant Shame on Hatch as they block traffic in front of the Federal Building, at 100 South and State Street, during President Trump's visit to Salt Lake City, Monday, December 4, 2017. (Rachel Molenda | The Salt Lake Tribune) Protesters gathered at the capitol building in Salt Lake City, Utah, on Monday, December 4, 2017, to protest President Donald Trump's plan to shrink Bears Ears and Grand Staircase-Escalante national monuments. 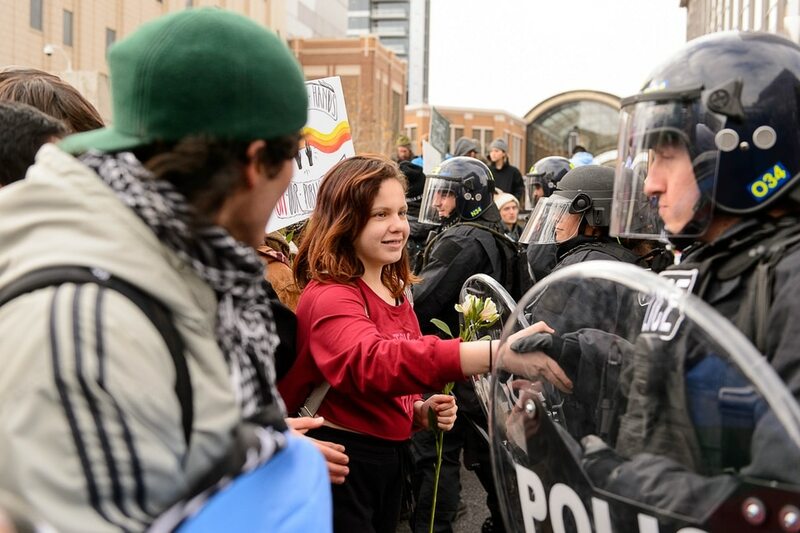 (Rick Egan | The Salt Lake Tribune) Rachel Hebert of Ogden, offers flowers to the Riot Police, as protesters blocking traffic on State Street, during President Trump's visit to Salt Lake CIty, Monday, December 4, 2017. (Rick Egan | The Salt Lake Tribune) Protesters kneel down as they block traffic on State Street, while protesting President Trump's visit to Salt Lake City to shrink two national monuments, Monday, December 4, 2017. (Rick Egan | The Salt Lake Tribune) Thousands of protesters turn their backs and march down State, as President Trump speaks at the Utah State Capitol, during his visit to Salt Lake CIty, Monday, December 4, 2017. (Rick Egan | The Salt Lake Tribune) Steve Oliver holds a sign while protesting President Trump's visit to Salt Lake City to shrink two national monuments, at the Utah State Capitol, Monday, December 4, 2017. (Rick Egan | The Salt Lake Tribune) Protesters protest President Trump's visit to Salt Lake City to shrink two national monuments, at the Utah State Capitol, Monday, December 4, 2017. (Rick Egan | The Salt Lake Tribune) Tefeleti Kfii chants as she marches down State Street among thousands of protesters, as they turn their backs and march down to the Federal Building, as President Trump speaks at the Utah State Capitol, during his visit to Salt Lake City, Monday, December 4, 2017. (Rick Egan | The Salt Lake Tribune) Protesters kneel down as they face the Riot Police, while blocking traffic on State Street, during President Trump's visit to Salt Lake CIty, Monday, December 4, 2017. (Rick Egan | The Salt Lake Tribune) Thousands of protesters turn their backs and march down State, as President Trump speaks at the Utah State Capitol, during his visit to Salt Lake CIty, Monday, December 4, 2017. (Rick Egan | The Salt Lake Tribune) Protesters kneel down as they block traffic on State Street, during President Trump's visit to Salt Lake CIty, Monday, December 4, 2017. (Rick Egan | The Salt Lake Tribune) Thousands of protesters turn their backs and march down State, as President Trump speaks at the Utah State Capitol, during his visit to Salt Lake CIty, Monday, December 4, 2017. (Rick Egan | The Salt Lake Tribune) Riot Police have a face-off with Protesters, as they block traffic on State Street, during President Trump's visit to Salt Lake CIty, Monday, December 4, 2017. Downtown workers left their offices to watch from the streets as the protesters chanted in the heart of the city. A police “public order unit” drove up, and several officers with body armor and shields jumped out and walked toward the crowd. Many from the crowd approached the shielded police. The ensuing standoff lasted about 20 minutes, with perhaps 250 standing in front of a line of officers, still chanting. More police holding shields and wearing armor arrived and joined the line. Some who were protesting called from the sidewalk for the group to exit the street and move back to the Capitol. Without any arrests or further clashes, the remaining protesters got on the sidewalk and headed north for the Capitol. Trump had already left town.